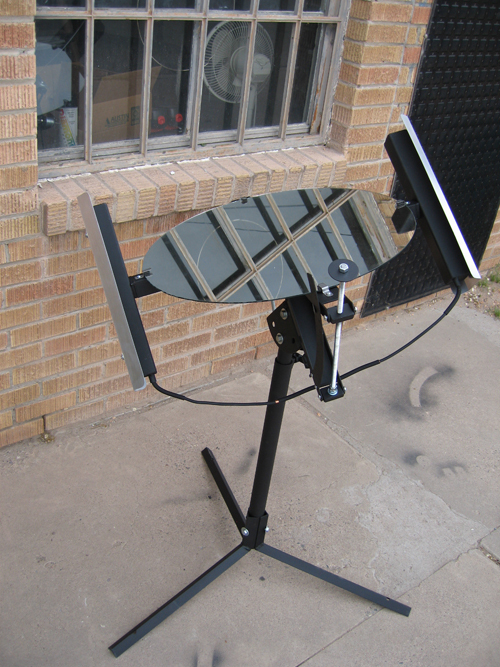 The Sundog tracks the sun using the same canister technology that we use in our tracking PV racks. This system translates differences in the temperature of the compressed gas in the two canisters into movement that keeps the Sundog’s mirror aligned with the sun and reflecting delightful, useful, electricity-free light into your home, office, classroom, or other space. Sundog not only provides light, it demonstrates to the mind as well as the senses the changes in the sun’s position throughout the day, month, and year. The minimalist design allows the user to understand how it works, and easy adjustability allows user to experiment with positioning. 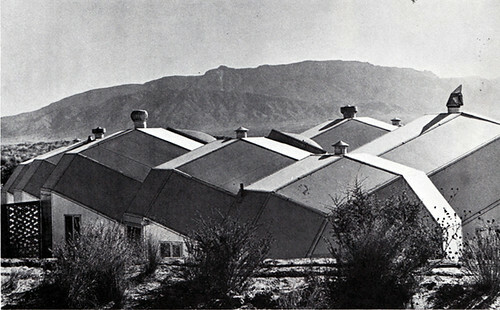 I discovered the Zomeworks Corporation last year when I found these photos of their 1969 “Zome” solar houses in a vintage interior design book. Each “zome” opens during the day to admit sun, and closes at night to retain heat. 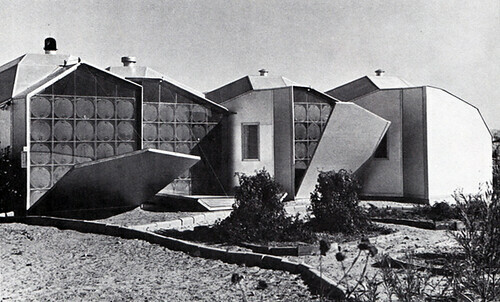 These dome-shaped “zonohedra” living spaces were Zomeworks’ main focus when it was founded in 1969, back when solar power and living off the grid was last fashionable. When I idly searched “Zomeworks” online, looking for more vintage photos, I was amazed to find that the company was still going. It has in fact been producing innovative solar energy technologies in Albuquerque, New Mexico for 40 years, and is now a serious producer of solar panels and other innovative solar devices. This entry was posted on Tuesday, December 22nd, 2009 at 1:15 am	and is filed under design. You can follow any responses to this entry through the RSS 2.0 feed. You can leave a response, or trackback from your own site. Have you heard of Rattenberg, Austria? Kind of a mega-scale version of the sundog to light up the whole town. I remember reading this snippet from the Walrus a couple years ago. Colin, thanks for that excellent link. Completely sci-fi, but a great idea! I guess the aristocracy in the castle always had sun in winter, but the lowlier types in the town below did not have that privilege. I’m glad to see the mayor is rectifying this. And I agree, long live zomes! So much ancient architecture already worked on this principle – conserving heat in winter, avoiding it in summer – but it seems that oil has made our building practices careless and lazy. It’ll be interesting to see if governments decide to get their heads out of the sand and start seriously supporting R&D for alternate energy and enery-saving devices. And I’d like to see businesses like Zomeworks – working for 40 years in alternative energy – receive more recognition. There’s a geometric construction toy called Zome (or Zometool). Now wondering if I’ve mentioned George Hart before? He makes good use of Zome to help visualise things before he makes his geometric sculptures. The zome pictured is alive and well and happily still inhabited by the original builders. It has gone through a few mostly-cosmetic changes, but continues to be functional and beautiful. I have had the pleasure of visiting the zome and can honestly say that the interior space is beautiful. They have been using Sunbenders as long as the house has been in existence and they definitely help light the interior during the winter and keep the heat (but not light) out during the summer.